Employees at Air Serv were looking for a meaningful and fun bike bike team event in Atlanta, GA that incorporated their core values: Integrity, Respect, Innovation, Collaboration, and Excellence. 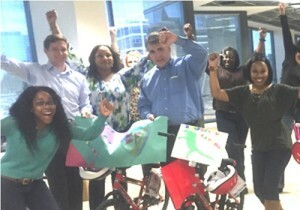 With that in mind, several team activities were created at a recent Build-A-Bike ® event for the group to bring the awareness of these values to the forefront. The group really go to know each other better as they raced against “being in the middle”, responded to some interesting questions, and played a match up game to define the Company values, identify personal relevance, and acknowledge their teammates. Air Serve is a corporation that provides innovative and dependable solutions to the aviation industry. 8,000 team members support the world’s leading airlines and freight companies at airports throughout the United States and United Kingdom. The teams were excited to start building their bikes and after being sorted, the teams came together, created flags and cheers that represented the stated core values. One team had a clear advantage during this competition. One of their team members was a former cheerleader, and they chose her as their team captain! Soon, the teams began to earn their parts to build bikes. There must have been too much fun going on because security asked if we could keep the laughter down to a minimum! Facilitator Michelle Riklan did her best to lower the volume a bit. When all the bikes were built, Neil Walker of Cycles & Change arrived with 3 lucky boys and 3 lucky girls who were presented with brand new bikes. Cycles & Change is an organization that believes cycling can be a catalyst for change, one person, one family, one school, and one community at a time. This fun event was held at Air Serv’s Corporate office in Atlanta, Georgia.